Ireland’s salmon is as legendary as its leprechauns, but much easier to find. 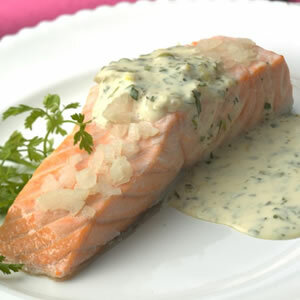 This recipe is a simple and delicious way to prepare the flavorful fish. Serves 8. Combine wine, fish stock (or water), carrot, celery, onion and dill in a medium or large saucepan over medium heat. Bring to a boil. Then reduce heat to low and simmer for 15 minutes. Add salmon. Bring liquid back to a boil, lower heat, cover and gently simmer for 15 minutes. Turn off the heat, but do not remove the cover. Allow the fish to sit in the water for 10 minutes before gently removing to a platter. In the meantime, prepare sauce. Put egg yolks in a double boiler or a stainless steel bowl placed over a saucepan of simmering water. Add the cold water and whisk to blend. Add the butter, bit by bit, whisking constantly and adding a new piece as soon as the previous piece melts. The mixture will gradually thicken. Whisk in lemon juice. To serve, skin the salmon and place on a serving platter. Garnish with parsley, fresh dill and lemon slices. Serve butter sauce on the side. If the sauce becomes too thick or the egg yolks start scrambling, immediately remove from heat and whisk in a teaspoon or two of cold water. On the other hand, if your sauce is slow to thicken, your heat might be too low. Increase slightly, continuing to whisk constantly, until you reach desired thickness.